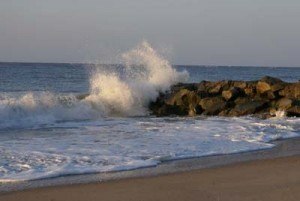 They consist of wood, cement, and rocks to prevent beach erosion and line each block of the beach. They are covered in sharp barnacles and moss, which further make them treacherous to the touch should a swimmer become lodged on them while swimming. During low tide, it is possible to see the entirety of the groin and even walk around it, although that is not recommended as a wave could be large enough to cause a beachgoer to lose footing and become seriously injured. The groins are significantly covered by water during high tide and the rocks are often hidden by the surf. Coupled with the strong currents of high tide and waves, it is possible to become thrown up against the groin by the water and become seriously injured. Its a general rule of thumb to enter the water in between the groins so that there is ample room on either side to avoid risking injury or death by hitting the rocks and being unable to get out of the water. It is also prohibited to stand or walk on the groins and signs are posted warning beachgoers of the risk. Though the groins provide a risk to swimmers, they also keep the beach from further erosion and provide a great area for sharks teeth to gather around. In addition to staying off of the groins, it is also necessary for beachgoers to stay off of the sand dunes and grassy areas of the dunes. This includes keeping items like beach chairs, sailboats, and any other item off of the dunes. Staying off the dunes protects the natural landscape of Edisto Beach and protects the sea oats that grow in the grassy areas. All of these measures are done to protect the beach and the beachgoers.